We know everything is always better with your mates by your side – so why not turn your squad into a team? You are guaranteed to have a better time. It’s pretty simple, right? You’ve got your fave people around you, it’s Sunday, you’re getting your happy endorphins pumping and you’re doing something for a VERY good cause…together!! Your Insta photos from the day will immediately be more popular (and better). We know a good group pic beats a solo selfie any day?? You can train together! Whether you’re walking or running, you can do a few practice sessions in a group and leave Spotify at home. Let your iPhone take the day off, and use this as a good excuse to hang out and be productive. 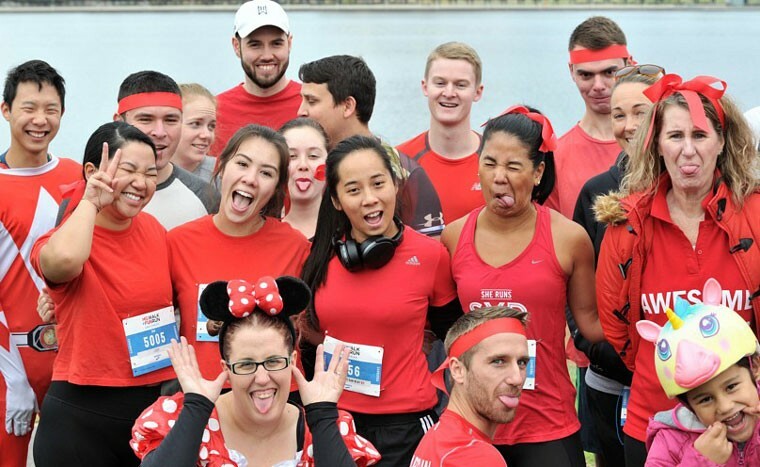 You know what they say…teams who train together, fundraise together! It is definitely easier, and more fun to fundraise in a team. You have more connections, more people to brainstorm with, and way more fun. THE MEMORIES!! You’re creating one of those awesome days that you can look back on and smile – with your mates! Ok, so now that we’ve spelled it out – create a team or join an existing team here!